Well, the garland disaster got fixed for the most part last night, although I still have a lot of fluffing and fixing to do before I show it to you. 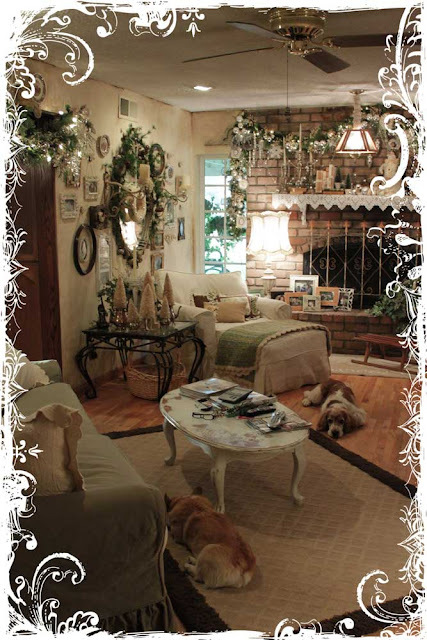 So for today I thought I would link up with Kathleen's White Wednesday and share pics of the Family Room. This is one of my favorite corners in the house. I do love my collection of vintage style Christmas trees displayed in slightly tarnished silver teapots and such. There is usually a tree where that chair is. I have been doing two trees every year for as long as I can remember. This year, there was just so much going on that I didn't have the time (or energy) to do the second one. My sweet hubby is very disappointed as he is a HUGE kid when it comes to Christmas. 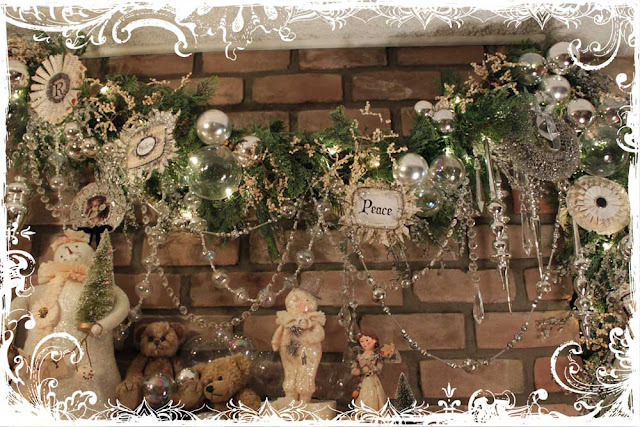 This is the garland and mantle decor above the fireplace. There are loose Glass balls scattered all over the mantle in clear and silver. I am currently having a strange obsession with containers filled with shiny Christmas balls. All the paper ornaments on the garland are hand made. Every year I am trying to make more but try as I might, I only seem to manage a couple before time runs out. This is a view of the Family room from the other direction. 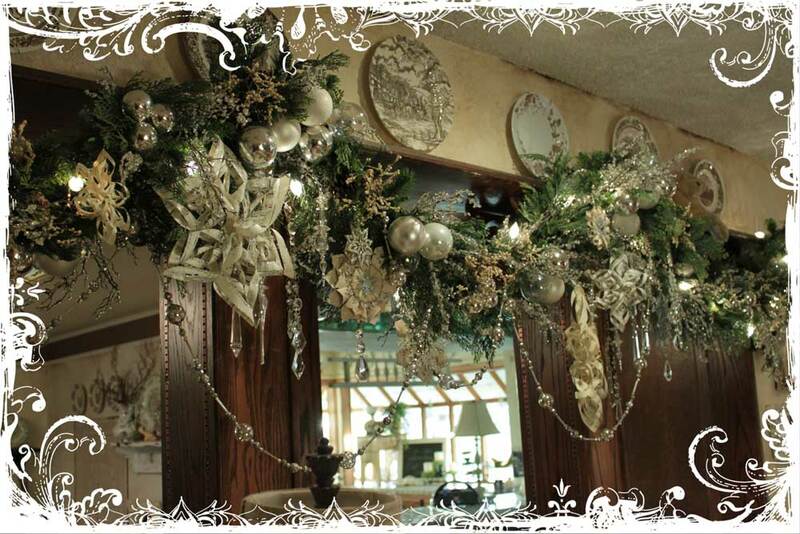 This garland also has handmade ornaments although slightly different in style than the other. The vintage style glass garland is new this year from a wonderful store called Rustic Stuff in Scottsdale. 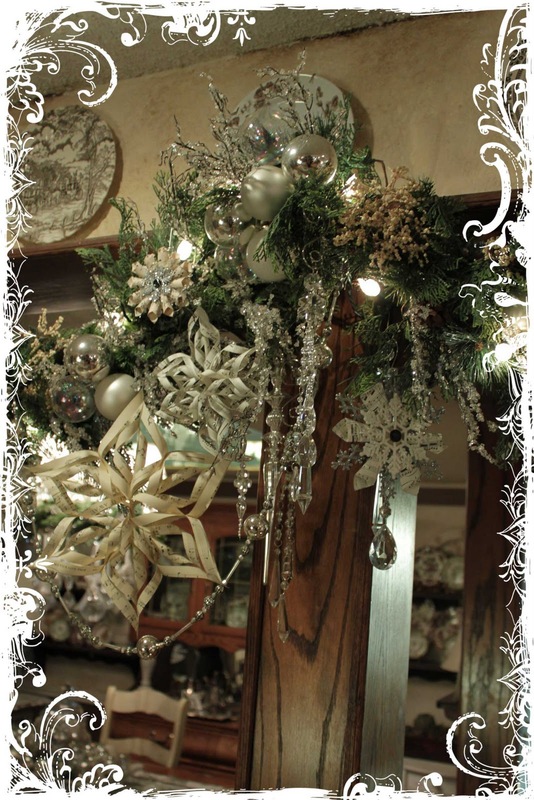 Paul does amazing Christmas displays there and never miss a visit before the Holidays. He also has wonderful sales on stuff the closer it gets to Christmas so go check it out if you can! I hope you enjoyed my little tour. Now I'm off to go visit the rest of you who are joining Kathleen for White Wednesday! It is absolutely gorgeous! I love those soft muted tones. I have no words except "oh wow!" I love your garlands, Karen, and all the sparkliness! Just so pretty. 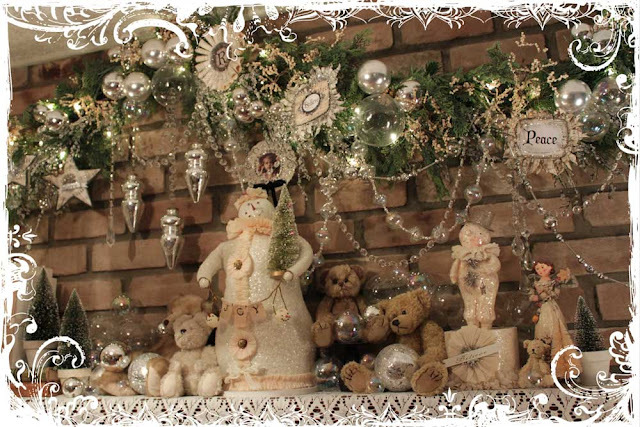 Love the mantel display and your little trees are just adorable and perfect for that table! What an amazing room. I can envision it filled with family and friends all laughing and relaxing and sharing good food. A very Merry Christmas to you and yours and blessings in the coming year. Love too, the glittering snowmen, and everything else, I could sit for LONG just taking in,all this beauty. Dear Karen I wish you a very merry christmas,-and all the best for 2011. Hugs,--- and thankyou for 2010.
ow..it's all so beautiful. i need to go back and have another look! Happy WW! Oh Karen! Your home looks so magical and dreamy!! I just posted a few pics of the little white Christmas over at Faded Charm myself. I so love what you've done in your family room! Just Gorgeous! Hope your Christmas will be calm and bright! Hi Karen. Your decorations are gorgeous. I am heading to Scottsdale next week so I am going to try and find that store. I have never been there. Thanks for the heads up on that one!! Hi Karen! Your home looks gorgeous!!! I love all the white and green! So much inspiration here! Your home is breathtaking!! I just love everything...my favorite color is green so it just took my breath away. Everything looks just beautiful, thanks for sharing with everyone, and thank you again for my beautiful blog! I have gotten a lot of nice comments about it. Oh my Karen!!! Your decorations are without a doubt the best I've seen!!! LOVE LOVE LOVE your style and what you've done! I can see why you ran out of energy!! Simply stunning!!!! Wishing you and yours a beautiful and happy holiday season! Everything looks so dreamy and soft. I love the colors and all of your vintage decor. This is stunning! It feels soooo cozy and it is just so pretty and fluffed up! I need more garland after seeing your pretty displays! Thank you for stopping by to say hi! WOW!!!!!!!!! !All your treasures are divine!!! I don't know what is my favorite! I do love the Teddy Bears on the mantle holding the shinny silver Christmas balls. 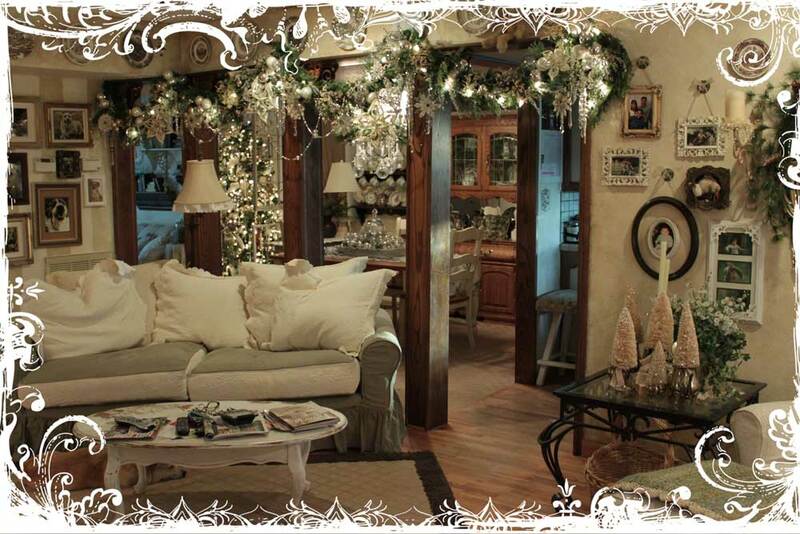 That garland is over the top wonderful & the handmade ornaments sooooooooo 2die4! I usually do more than one tree too but, this year just really decked out my 9 foot tree(with really wide branches that gobble up ornaments). Thanks for sharing. HUGS! Your home is truly beautiful, so warm, charming and inviting. Your Christmas mantle is over the top gorgeous! 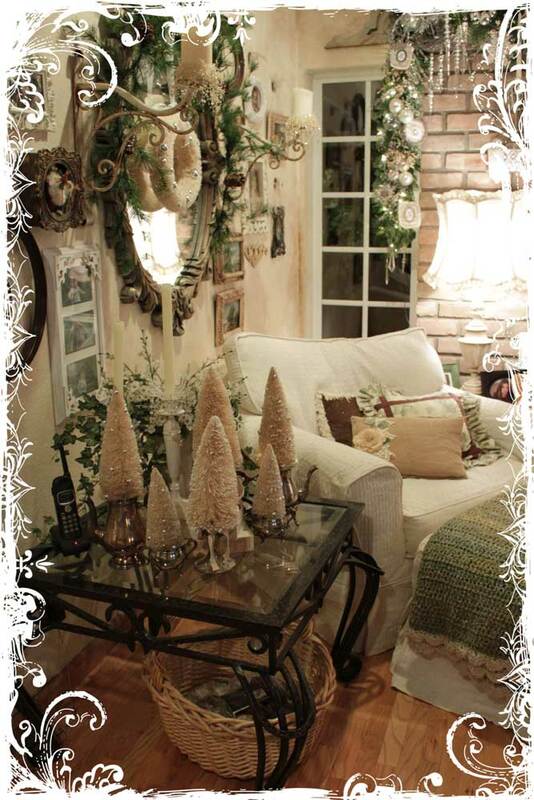 I love your vintage tree collection and the way you've grouped and displayed them. I love to display like items together too. You've made me want to do a green and white room! I also loooooove the plates hanging on the wall. This is so pretty...my kind of room! Your home is just beautiful! I could just gawk all day at the attention to detail. You are a very blessed designer of not only blogs but homes. Have a very Merry Christmas! Hi Karen, I just love your mantel, it's absolutely gorgeous... and love the little Christmas trees too, their adorable. Wishing you and your family a Merry Christmas!!! ...Wow Thanks for sharing!..A dessert buffet couldn't be any richer in inspiration! Oh so very beautiful- sweet christmas blessings to you! Oh Karen your Christmas decorations are just gorgeous. I think I'd be wanting to leave them up all year long. I always display my favorite Christmas balls and I love the silver ones you have displayed on the scale. So very clever. Merry Christmas to you and your family and thank you for your beautiful blog design. Hi, Karen. I'm catching up on some blog parties. Your home is just gorgeous. 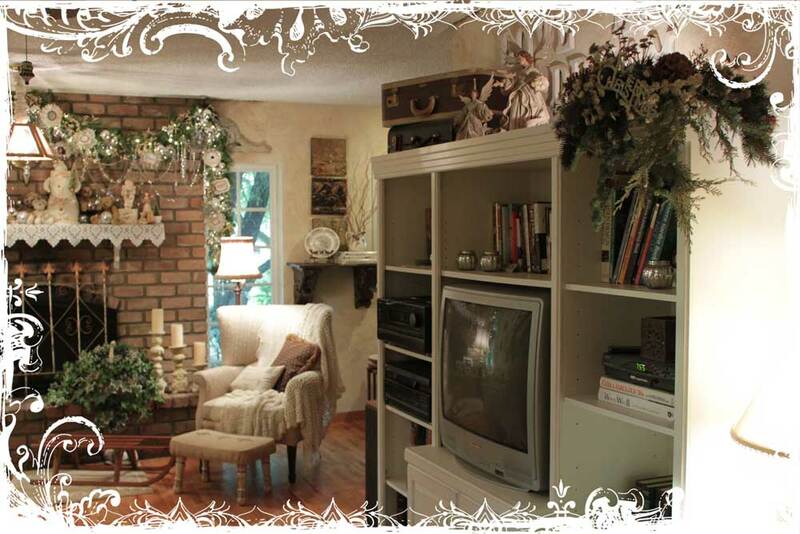 I really love the garland over the fireplace. I hope you are doing well and that you have a blessed holiday! Your home is gorgeous!! You do the winter white pefectly. Thanks so much for sharing. Your Home Looks Beautiful! So Delicate and So Wonderfully Vintage! Your blog is as dreamy as they come... so BEAUTIFUL! I love your garland! YOUR HOUSE>...Mmmmm so lovely! I could go on and on but it would more than fill this space...so with that said, I'd like to invite you to come over and visit me...please be my new friend. I love it all. It is like an enchantment for sure. I mean you Christmas decorations. 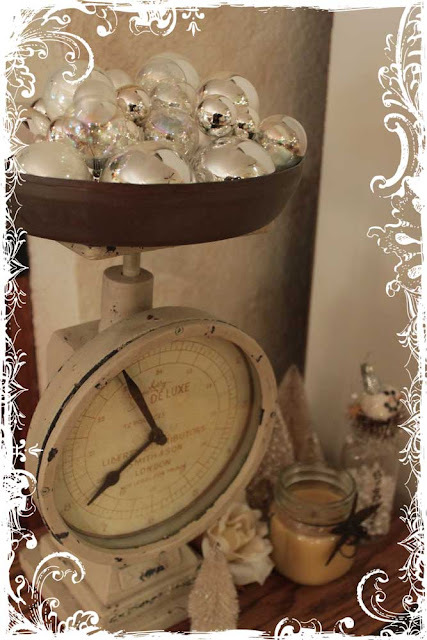 I would love for you to see my vintage 30's snowman I posted on my blog a few posts back. I would love to have your input on him. Hope you have a great Christmas weekend. Beautiful - beautiful - beautiful - I just want to stare at these photos forever - I love the glass balls - could easily be an obsession for me also - and your precious collection of bottlebrush trees - love it all!